The Project 2016 AutoFilter feature is turned on by default for all new schedule files. Arrows appear in the column headings in the displayed sheet. 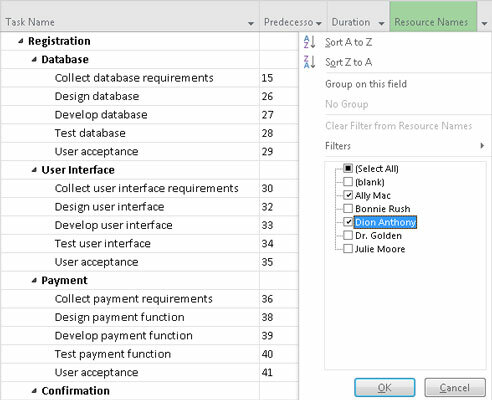 When you click the arrow in the Resource Names column, for example, the name of every resource assigned to tasks in the project is listed in alphabetical order, along with other filtering and sorting choices. See the following figure for an example. Deselect the check box beside any item to hide it. In the AutoFilter list for a column, select check boxes to control which items appear onscreen. Selected items appear, and deselected items are hidden by the filter. If you want to display only a few items, clear the Select All check box first to deselect all items and then select the check boxes next to individual items to reselect them. Then click OK and your filter is applied. You can also choose the Filters option from an AutoFilter menu to access predefined filters. For example, this figure shows the predefined Is Greater Than filter that’s available to the cost-related fields in the Cost table. In this case, the filter shows any task with a cost (total cost) between $2,000 and $4,000. AutoFilter choices are specific to each field. Display the view and table that contain the fields (columns) you want to filter. Arrows appear at the top of every column. Click the arrow on the column you want to filter. Use the Filters submenu to select a filter. Select a predefined filter. For example, if you’re filtering for task cost, you can choose filters in the Total Cost column that look for costs greater than, equal to, or less than specified amounts. 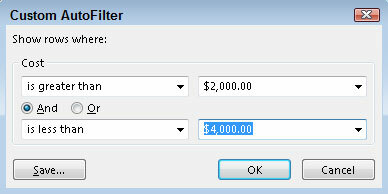 You can also set up another filter that looks for costs between two specified amounts. The Clear Filter from Field Name choice removes a previously applied filter. Any task that doesn’t meet your criteria temporarily disappears from the view. To apply highlighting to items that meet your filter criteria rather than remove nonmatching items from view, use the Highlight list in the Data group on the View tab. This list works like the filter does except that it highlights the applicable tasks.